STB is not responsible for the accuracy, completeness or usefulness of this publication and shall not be liable for any damage, lost, injury or inconvenience arising from or in connection with the content of this publication. You should verify or seek ciarification from the individual third parties referred to in this publication. Singapore is bursting at its seams with endless attractions and activities. 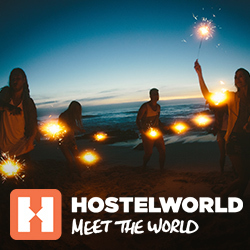 A world of experiences clamours for your attention, each one promising an enriching and enchanting memory. With so much to do and see, one of the best ways to experience the City is to engage the services of apersonal Tourist Guide. From its humbIe beginnings as a trading post, Singapore has grown into a burgeoning metropolis brimming with unbridled energy and excitement. Bridging the East and West, the citys harmonious blend of age-old traditions and cutting-edge innovations offers a distinctively unique experience. slice of Singapore with you. Every discovery will be infinitely more meaningful because of your new-found appreciation for all the ideas, lifestyles and people that make up Singapore‘s unique cultural tapestry. knowledge ofthat location‘s rich history and its corresponding local relevance. From the sights and sounds of vibrant ethnic communities to tranquil parks and gardens, from rich heritage sites to spectacular new architecture, you‘ll want to experience them all. 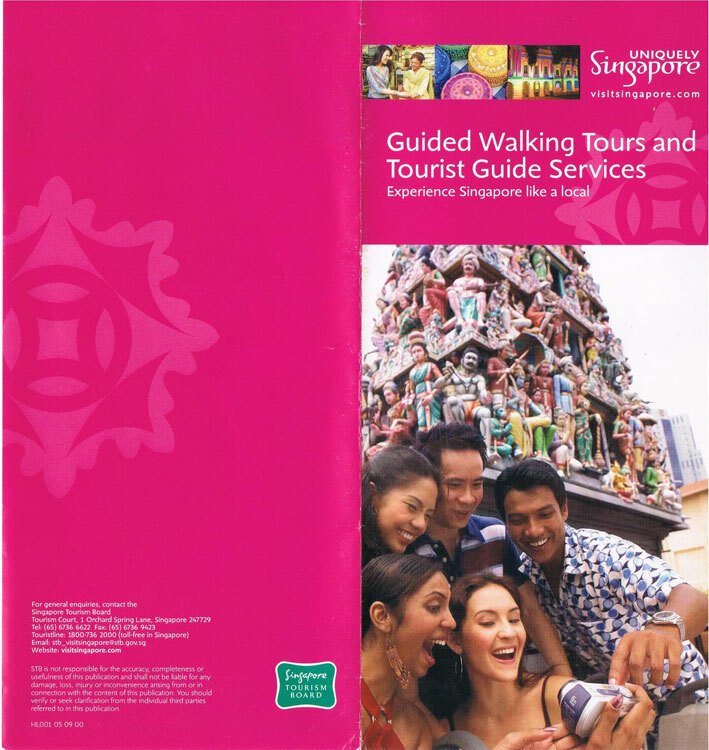 With Singapore Tourist Guides planning your journey for you, you wont have to miss a thing. Select from a ist of highly qualified and certified General Tourist Guides who will play host to you as you journey around the island. Language will not be a barrier — our Tourist Guides are able to converse fluently in various languages, allowing you to experience Singapore with ease. In view of the high demand for this service, we advise you to book your Singapore Tourist Guide early in order to avoid disappointment. 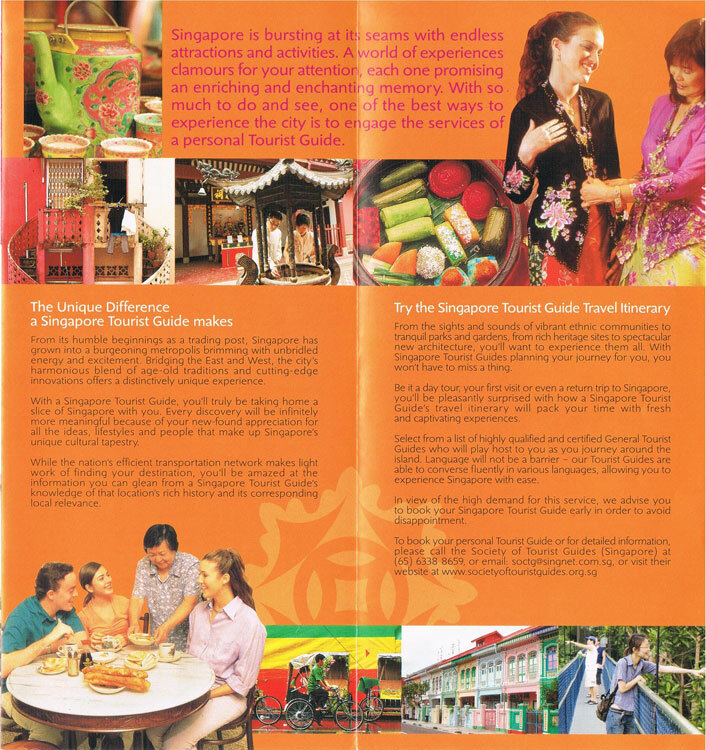 Come and enoy specially created walking tours with qualified tourist guides icensed by Singapore Tourism Board. We bring you a selection of tours, exclusively designed to represent the cultural diversity and religious harmony of Singapore. These tours will give you insights to the way locals live, where they come from, how they work and play. Find out who established the first Catholic church in Singapore, how this area came to be part ofa European town, and more. You‘ll begin with a visit to the grounds of St. Joseph‘s Church, which traces the beginning ofthe Portuguese Mission in Singapore and the significance of this church to the local Eurasians. Enjoy the peaceful surroundings of Queen Street and learn of Father Beurel‘s role in establishing the Cathedral oft he Good Shepherd and St.Joseph‘s Institution. This tour also takes you through how the mission schools were set up by the churches so children of different races could attend. Today, after careful restoration, the developed Waterloo Street Arts Belt houses many art groups. Within this belt lies the historical Sculpture Square, the former site of a late 19th-century Baba Methodist church, and current home to art exhibits. Do stroll by some ofthe graceful bungalows once occupied by Jewish families, and bear witness to an art that has withstood the test of time. Marvel at the harmonious coexistence of the Buddhist temple and Hindu temple. Watch the lively atmosphere outside the two temples where people come to worship and seek divinations about the future. And if you stop for a moment, you‘lI feel the generosity of the Kwan Im Thong Hood Cho Temple, where education grants are extended to all students, regardless of race or religion. Trace the beginning of one ofSingapore‘s original dish, Hainanese Chicken Rice. Hainan is a tropical island located south of the Guangdonq province, China. The Hainanese immigrants settled in the Beach Road area forging a strong community spirit. The streets were subsequently named after them: First, Second and Third Street of the Hainanese. Visit the temple dedicated to the Goddess of the Sea that was estabhished by the Hainan Clan Association and learn about its importance within the community. Stroll along Purvis Street and learn marc about other flavourful Hainanese dishes while appreciating the ornate designs of old shophouses. Tour Fee: SGD 18 (Adult) SGD 10 . This tour takes you from the south bank of Singapore River, overlooking the19th-century European town to the edge of Chinatown. Amidst the towering skyscrapers, your guide will share the secrets of many hardworking immigrants who made it, along with the stories of rnany unnamed men and warnen who toiled to build this city out of a sleepy village. Contemporary artists capture the spirit of adventure and enterprise with their rnasterpieces proudly exhibited beside the modern architecture. You can also observe how the locals keep their faith at the mosques and temples around here. You‘ll start at Bukit Timah, the tree-Iined outskirts of the Central Business District. Discover at once the heartlands with its distinctive sounds and multitude of colours and smells. Then let your Tourist Guide show you the varied curries cooked in different styles by the local ethnic groups: Chinese, Malay, and Southern Indian. There‘s no better place to do this than in the local wet market. Observe the rites in a Hindu temple and the fascinating stories behind the festivals celebrated here. Learn about the various traditional costumes and you may be inspired to learn how to wear a sari. Nothing beats the heat better than a refreshing yoghurt drink called Iassi. Other choices include teh tank — tea with frothy milk and tea boiled with spices, known as masala tea. This is also a good place to ask your guide about the intricate architecture found in the conserved shophouses Iocated nearby. 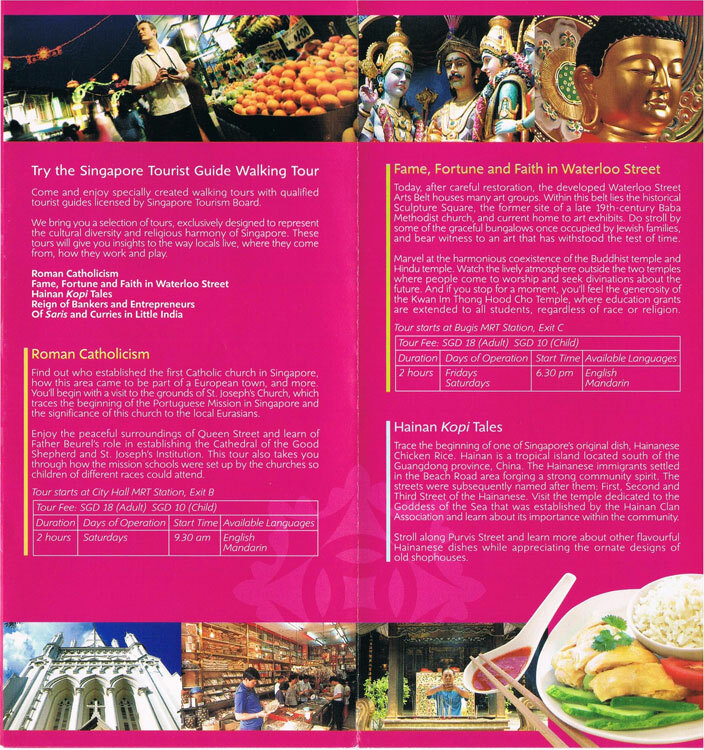 Walking tours organised by the Society of Tourist Guides (Singapore). 1. Advance booking is required. Please make bookings at least 24 hours ahead. 3. Please make payment in CASH to the guide before the start of the walking tour. 4. Private tours can be arranged upon request. Rates on application. 5. Tourist Guides are trained by the Society of Tourist Guides (Singapore) to conduct these tours and are Iicensed by Singapore Tourism Board. 6. Tour itinerary and stops may be changed at the discretion of the assigned guide in the event of circumstances beyond our control. Information correct at the time of printing. 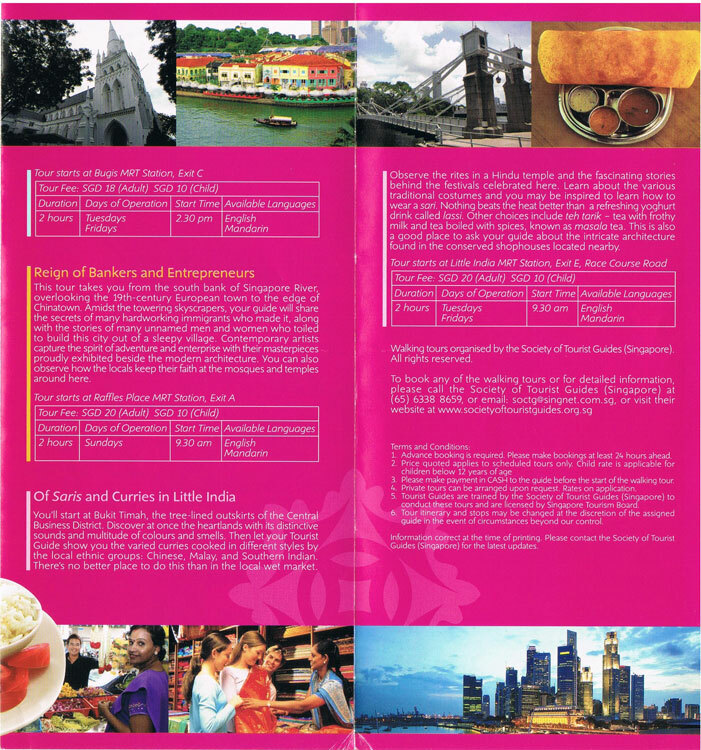 Please contact the Society of Tourist Guides (Singapore) for the latest updates.